EAM Pitfall #2 - Using the Wrong Software for the Job | SwainSmith, Inc. This is the third post in our blog series, 9 Reasons EAM Implementations Fail (And How to Fix Them). You wouldn’t use a hammer to put in a screw. You wouldn’t use a wrench to drive a nail. So why would you use a software system that’s not designed for enterprise asset management to manage your assets? These days, hundreds of software products market themselves as asset management solutions. However, not all of them have the features you need to improve reliability, reduce costs, and manage risks for a large portfolio of assets. In general, these software products fall into three categories: enterprise resource planning (ERP) systems, computerized maintenance management systems (CMMS), and enterprise asset management (EAM) systems. ERP systems are broad platforms for managing all of a business’s activities. They often have a module for asset management alongside modules for finance, human resources, supply chain, order management, and other core business functions. ERP systems are a boon for IT because they handle all of a business’s information and activities under a single platform, eliminating duplicate or incompatible technologies. Because of their broad focus, however, ERP systems are often less powerful and harder to use than EAM systems when it comes to asset management. CMMS are streamlined tools for managing maintenance operations. Their main focus is work order management, but they often include additional features for asset tracking, preventive maintenance, inventory management, and MRO procurement. CMMS work best for small and medium-sized businesses (SMBs) that have a single location and a limited number of assets. They are great for maintenance management, but they lack the depth and power of EAM systems when it comes to managing physical assets across a large business. EAM systems are dedicated solutions for managing physical assets. They are designed to track all of the activities that affect the cost and performance of an asset over the course of its life cycle. EAM systems include the same features as CMMS applications, but also provide tools for managing projects, vendors, invoicing, asset safety and reliability, cost tracking, accounting, and more. They are designed to support multiple sites and business functions, like an ERP system, but with a deeper and more specific focus on asset management. 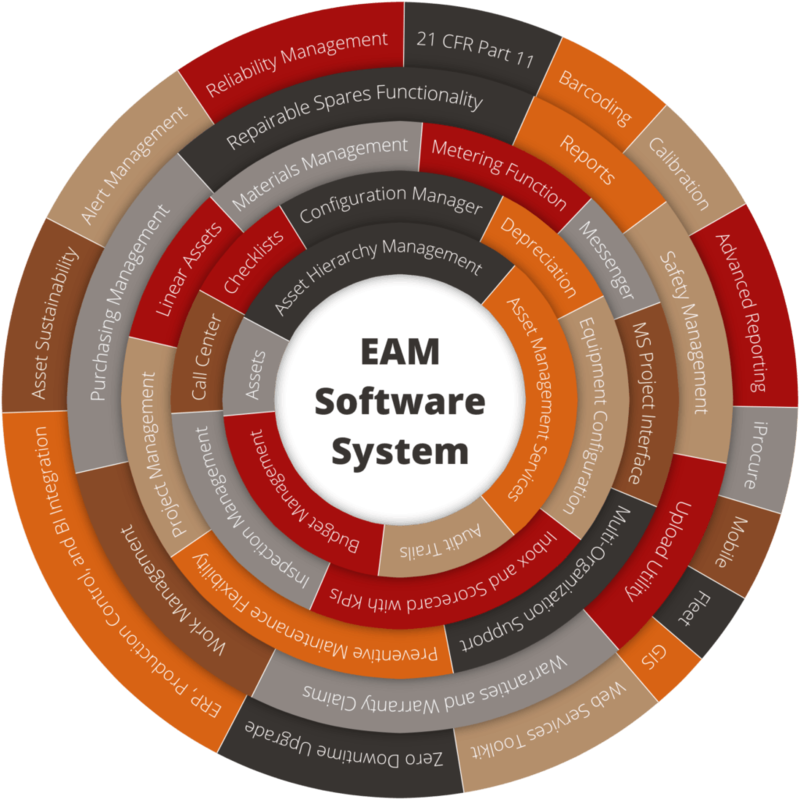 A true EAM software system contains a wealth of features for enterprise asset management. EAM vs. ERP: Which Is Better for Asset Management? SwainSmith recently helped a multi-site refinery select a software system for enterprise asset management. As part of the software evaluation process, we compared best-in-breed EAM systems with ERP system modules, focusing on functionality and efficiency of use. On a scale of 200 possible points, the EAM systems came out 25 points on top. For asset management functionality and ease of use, EAM systems are the clear winner over ERP systems. Of course, ERP is still the standard for financials. To get the best of both worlds, you should integrate your EAM system with your ERP system so that the two systems can share data. CMMS and EAM systems are both designed to manage maintenance work and physical assets. But the similarities end there. These two types of software are radically different when it comes to scope and approach. CMMS focus on maintenance, while EAM systems support multiple business functions. CMMS start tracking after an asset has been purchased and installed, while EAM systems track the whole asset life cycle, starting with design and installation. CMMS are designed to manage a single location, or offer limited multi-site support, while EAM systems come with extensive features for managing multiple sites and businesses. The table below provides a side-by-side comparison of common EAM and CMMS features. This is why organizations that are serious about asset management rely on EAM systems to get the job done. EAM systems offer the broad, powerful, unified feature set that asset-intensive operations need to make the most of their physical assets. When it comes to asset management, ERP and CMMS can’t compare with EAM for power, flexibility, and ease of use. That shouldn’t be surprising: ERP and CMMS weren’t designed to do that job. What is surprising is how many equipment-heavy organizations still use ERP or CMMS products to manage their physical assets. For an asset-intensive organization, physical assets are second in importance only to human assets. Their performance has a huge impact on a company’s profit margins. Why use a substandard tool to manage the second most important set of assets in your business? Don’t settle for the wrong software tool. Use an EAM solution that’s designed specifically with enterprise asset management in mind. Next week, we’ll discuss setting goals and improving buy-in with asset management policy, strategy, and objectives. That’s in our next post, EAM Pitfall #3: Lack of Organizational Alignment. Tracy S. Smith has been helping organizations implement successful EAM software systems for 20 years. He is the president of SwainSmith, Inc., an EAM solutions company. He also offers complimentary 30-minute EAM consultations—no sales pitch or a pesky follow-up call. Just straight answers to your questions—and an objective, experienced assessment of your issues and goals. 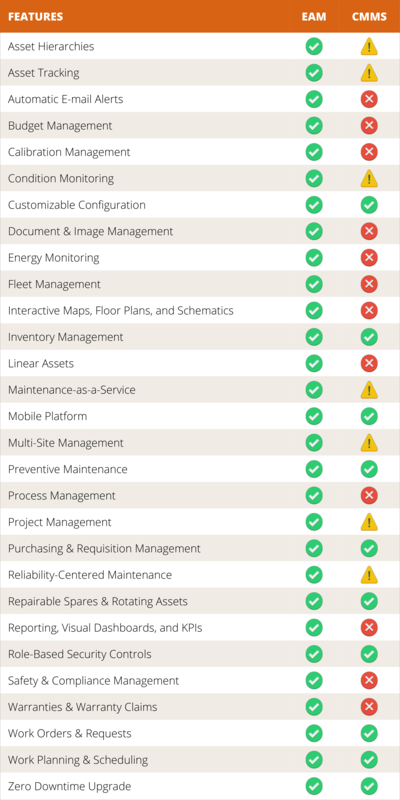 Evaluate your asset management software implementation with our self-guided EAM/CMMS Implementation Checklist. Our checklist covers all of the critical areas for EAM/CMMS success, including business process, software capabilities, master data, and performance management.